Co Q-10 supports heart health. 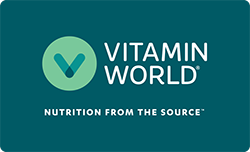 ** Formerly known as Q-Sorb Co Q-10, Vitamin World's Co Q-10 is a natural, highly bioavailable form of Co Q-10, identical to that found in the body. Our unique formulation enrobes the key nutrients with antioxidants, ensuring potency and purity. Finally, it is hermetically sealed in rapid release softgels, providing superior absorption. Co Q-10 200mg is rated 4.6 out of 5 by 79. Rated 5 out of 5 by Sunny from Excellent product. I will buy it again. This product is great and the price is right. Rated 5 out of 5 by Jelis from Excellent love it best product ever, I have more the 5 years using and I feel perfect. Rated 5 out of 5 by Doggydoc from Excellent product High quality product and easy to take. Rated 5 out of 5 by Hilly from I would recommend Great product. I take it every day. Superior to other brands in price and quality.